Iconographic productions, these DVDs are shot directly from the original art and are word-for-word narrations of the book text. Public performance rights included. This hysterical tale is now available as a single title DVD, with program selection that offers the option to view text along with narration of the program! 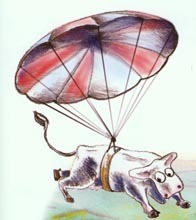 Cow-napped by a Space Cowboy named Zork, Moo Cow finds herself zapped -- KABOOM! -- from the farm and the star attraction in The Inter-Galactic Rodeo on Planet 246.